Skin care has always been important to me but it wasn’t until I turned 30 and began to see visible changes that I really started to take it more seriously with a daily/nightly skin care routine. I love trying new beauty and skin care products! When I was offered an opportunity to work with Alina Skin Care, I was super excited to learn more about their products, try them out, and see how they work. I received two complimentary products to facilitate my review: Vitamin C Serum and Ultimate Eye Cream. My skin type is pretty normal but as a mom/entrepreneur who is almost always up late, I tend to get tired looking eyes (either dark circles or a little puffy under eye baggage). The Alina skincare Vitamin C Serum with Hyaluronic Acid and Anti-Aging Formula comes in a medium-sized glass bottle with a pump. I love skin care products that are easy to use, so this was great! Alina Skincare claims to have superior ingredients that deliver superior results. Their Vitamin C Ester delivers vitamin C in the finest form and is clinically proven to be gentler on the skin while delivering dramatic results. It also includes Inflacin, a patented formula which is clinically proven to calm irritated skin. The Alina Antioxidant Blend is made of a unique blend of green & white tea to help protect against damaging oxidative stress and free radicals. Finally, the Osomes is another patented formula that is clinically proven to deliver more active ingredients deeper into your skin for better results. I applied a small amount to my face and neck each morning (you can also use it for morning and night) and found the product to feel very light and natural. It has a hint of a citrus scent which was very pleasant. After using the product, my skin was certainly more hydrated and smooth. I really liked how comfortable this product feels on my skin. Some products are a bit heavier and this one feels just like your natural skin after application. I used this product during winter, which is very dry in Utah, and was very thankful for the extra hydration it brought to my skin. I also think it will feel very soothing during the hotter summer months when my skin is more exposed to the hot sun. Overall I would definitely recommend this product! 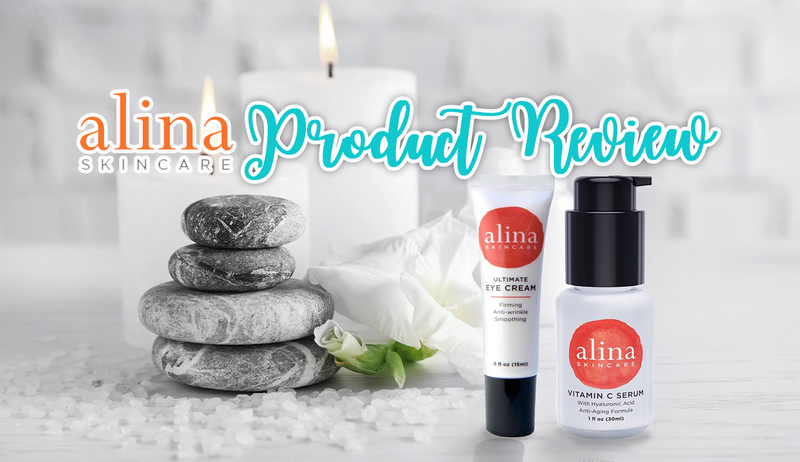 It’s also on the more affordable side, so if you are hoping to find a great skin care product you can use regularly, Alina Skincare would be a great choice! This is another product I was super excited to try! The struggle is real with the dark circles under my tired eyes. The Ultimate Eye Cream comes in a small tube and lasts for quite awhile. It is designed to work immediately to help reduce fine wrinkles while brightening and smoothing the eye area. It is made up of an innovative blend of red microalgae, oat kernel extract, hyaluronic acid, and a proprietary Alina antioxidant blend, which has been created for all skin types. Unlike the Vitamin C Serum, this one has no scent. Let me warn you, a tiny amount goes a LONG way! The tiniest of drops on your fingertip is plenty to apply to both under eye areas. The eye cream is clear with a white tint to it and feels a little more slippery than the Vitamin C Serum. However, it dries SUPER fast and once it’s dried, you don’t feel it at all. I used this product every night before bed and was pleased with the results. I could feel a difference in my under eye skin and it did also help reduce the appearance of dark circles. This product is also very affordable and because you get SO much usage from the small tube, I would say the value is pretty incredible. Again, I would recommend this product to anyone looking for a regular skin care routine as something for daily use. Together, the Alina Skincare Vitamin C Serum and the Ultimate Eye Cream compliment each other very well delivering great results at a great value. Speaking of value, I wanted to tell you guys about how you can get a FREE full size product from Alina Skincare! Alina Skincare offers several great products and if you’re like me, you’ll want to sign up for their list so you can get a free product! Simply visit www.alinacorp.com/trial and sign up. The promotion offers you the opportunity to get an Alina Skincare product for only $1 via Amazon and once you use it, you can redeem for a FREE FULL SIZE product to use next! The promotion opens up a few times throughout the year so you won’t want to miss out! If you can’t wait for your free trial, you can purchase the products I mentioned via Amazon below. Alina Skincare has OVER 1,300+ great reviews! It’s also available for Subscribe & Save so if you’re like me, you never have to run out! Have YOU tried Alina Skincare products? Disclosure: This post was sponsored by Alina Skin care. The products included in this post were provided to me complimentary to facilitate my review. All thoughts are my own. I choose to only share about products I actually use and like to keep things honest. Links in this post may be affiliate links. Should you wish to make a purchase, I may receive a small commission to help run this blog and bring you more great content. This is no additional cost to you and I’m grateful for your support of this blog!